Last week, it was revealed that Whitesnake’s 1984 studio album Slide It In would be reissued as a deluxe edition later this year. It’ll arrive on March 8 via Rhino/Parlophone on CD, 2CD, 2LP on digital and streaming platforms, and as a seven-disc box set titled The Ultimate Special Edition, to mark the record’s 35th anniversary. Along with remastered versions of the UK and US versions of the album, the 6CD/DVD version will also come with a raft of bonus material – including a previously unreleased live set which was recorded at the Glasgow Apollo on March 1, 1984. Now the band have released Ready An’ Willing from the show and it can be listened to below. 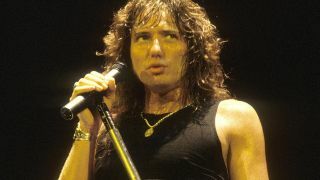 Speaking about the reissue, Whitesnake frontman David Coverdale said: “Slide It In was always meant to be a structured, more electric modern take on the classic blues-based hard rock that Whitesnake were famous for – but our new Hook City Hooligan, Mixer Extraordinaire Christopher Collier, has hand-tooled this classic record for the 21st century. “Hearing all the performances so fresh and so clear after 35 years was amazing. Mel, Cozy and Jon’s playing on the record is as vital now as it was all those years ago. All the featured players shine." Whitesnake will head out on tour across the US later this year and will return to Europe in the summer for further dates.